The SAG InfoTech has presented a new application for an educational consortium, i.e. 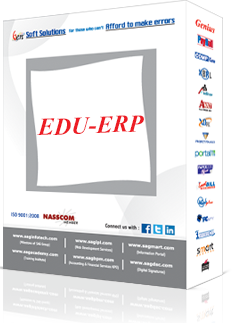 SAG Education ERP (Enterprises Resource Planning). The SAG ERP is a web based application that could be accessible from all across the globe. It provides an easy way to automate all functionalities of an Educational consortium. The ERP has a list of various modules that is very helpful for the management, students and guardians. Here, you can also request for the individual modules according to your needs. This application provides attractive environments where you can manipulate data and information about the management, teacher and students easily. This application provides a bridge between the faculties and parents by allowing parents online access to view student’s progress, attendance, grades, etc. This software has a various modules and each module provides the detail structure of the module. 1. Admin Login: This module allows the admin to manage the information of student and teacher. And, the admin has right to create, delete and update the information of student and teacher. 2. Faculty Login: the faculty can get the information of lecturer and subject by the valid user name and pass code. 3. Student Login: the student can get the information about the attendance, marks/grade, time table and much more. The student can log-in by valid username and passcode. The student can access their profile to view attendance report, timetable or class schedule, exam information and result. It provides the facility to download the admit card. It provides an attendance summary (Monthly or Yearly) of the student. You can also generate attendance reports in pdf and doc format. The admin manages the database of books. The admin monitors the transaction of the issue and return books. The admin can search the book by book name or category. Admin can add books in stroke. This module provides the information of examination. The student can download admit card directly from the portal. The student can check availability of rooms. The administrator can add more room. The admin has right to assign rooms for student. This module helps the School/College/University to categorize the timetable according to the subject and class. The admin has the authority to update and delete the time table of class. The management of School/College/University provides the information about the transport, which includes Driver/Conductor name, bus number, bus route, arrival/departure time and much more. In this field, the search option provides a list of bus numbers. The Add New option allows you to fill the details of bus such as Vehicle Details, Policy Details, Road Tax, etc. This field allows you to get the information about the driver/conductor by the View button. You can create a new profile of driver/conductor by clicking on the Add New button. The Transport module contains sub-module such as Allot Driver/Bus, Bus Expenses Details, Bus Route Details, Bus Card, Bus Stoppage, and Bus Stopping Fair. This module helps you to manage the account section, and it consists some other field such as fees head master, class fees structure, generate bills, students fee structure, fee receipt, head combine, late fees fine and fees report. The master module allows the admin to enable or disable the setting for the faculty and student. This field consists some other features as branch master, room master, students sweeping, allot room, assessment year and much more. This field allows you to manage and schedule the sports activities in your organization. With the help of this tool one can issue the required sporty equipments. This module handles the account section. The SMS service allows you to send the information to the parents of the student regarding to the attendance, marks report and parents meeting. Web Based: - For the SAG Edu. ERP, user doesn’t require any software installation on their computer system as it is a web based application. They can start working on web browser. Customization Ready: - This Application is built as per module and the module is customizable in the ERP. Affordable Pricing: -SAG Edu. ERP is built module wise and hence, selecting module option in the ERP, it becomes cost effective. Useful for Schools or Colleges: - You can use the SAG Edu. ERP for all kind of Education institution like- Schools, Colleges, Universities and Training Centers. Customize Report and Export: - User can get customized reports in the ERP and it can be exported in XLS format as well. Customize Search: - User can create customized searching in the ERP for Students along with other searches. Other Benefits: - You can generate fees structure for whole year and apply it on all students with a single click. Late fees and other fines are easily manageable in the EDU ERP.